Founding winemaker Chris Upchurch and heir apparent Jason Gorski used two estate vineyards for the foundation — Grand Ciel and Upchurch — with Ciel du Cheval (26%) and Klipsun (14%) adding historic subtext. Barrel spice from 20 months in 75% new French oak and herbaceousness leap from the glass to make for an instant treat, followed by classic Cabernet notes of dark cherry, cassis, blackberry and fig. It’s a full-bodied treasure off Red Mountain that reflects winemaking finesse. 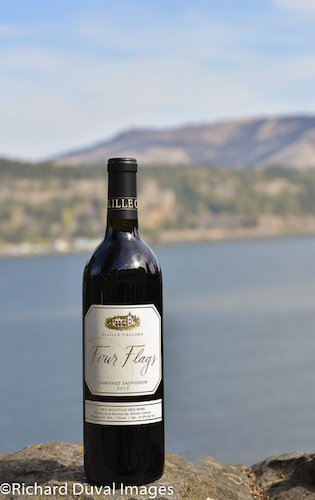 This signals the fifth vintage of Four Flags, and the string of praise from critics continues, including a gold medal at the 2018 Great Northwest Invitational Wine Competition.